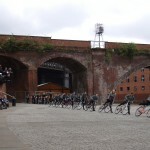 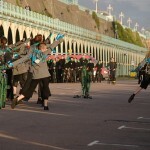 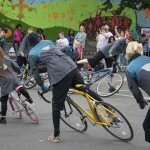 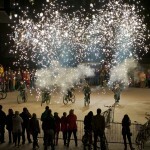 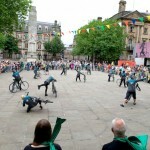 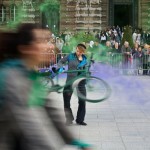 ‘Bicycle Ballet brought a unique form of movement and participation to their festival performance in Skegness. 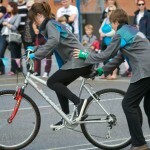 The graceful performance by scores of two wheeled performers in a synchronised ballet of velo movements was compelling to watch. 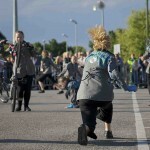 A memorable participation project for our growing dance community.‘ Robin Morley, Artistic Director, So Festival. 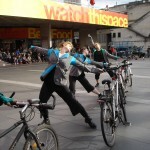 Bicycle Ballet is a spectacular dance performance on bicycles which explores the highs and lows of city cycling: the sheer joy of swerving downhill on a bike, the wind behind you and the sun on your face, tempered by the gritty reality of urban cycling – manoeuvering amongst traffic, pollution, theft and vandalism. 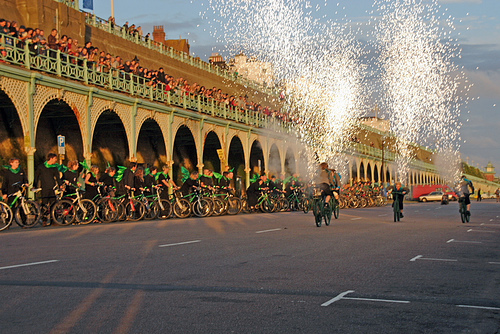 10 to 100 local people dance and cycle between set formation pieces reminiscent of Busby Berkeley’s film choreography, with visual spectacle, humour, poignancy and character based stories inspired by people’s cycling experiences – learning to ride, fall off, tricks – and memories.